Stay at the only full service hotel in Midwest City, OK located 5 minutes from Tinker AFB, business office parks, shopping and within 10 minutes from downtown Oklahoma City Bricktown and Entertainment District, Chesapeake Arena and Cox Convention Center. Spacious rooms designed for comfort and convenience for work and play, complete with free in-room safes, bottled water and mini fridge. 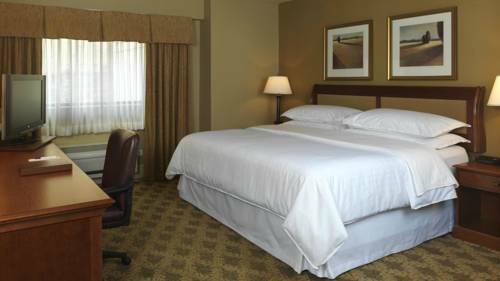 Our Midwest City hotel features a concierge lounge, restaurant and bar, Starbucks Coffee and free wireless internet. Relax in our indoor pool and workout in our upgraded 24 hour fitness center. The hotel connected to the Reed Conference Center features over 30,000 square feet of flexible meeting space for special events, conferences and conventions and boasts over 10,000 square feet of outdoor space with beautifully landscaped grounds, or go for a run-walk on our mile trail or unwind with a cocktail in the courtyard. Emerald Restaurant & Bar: Enjoy great specials and our signature Emerald Eye Martini at Emerald Restaurant & Bar. This gourmet restaurant is open for breakfast, lunch, and dinner with an appetizing all-day menu.